Welcome to the Inclusive Workplace and Supply Council of Canada (IWSCC) and thank you for being here! When the gap in Supplier Diversity in Canada became evident to us, we knew there was an opportunity to make a difference. Launching the IWSCC and this website is the culmination of a year of hard work and collaboration we are both excited and very proud! The IWSCC is a non-profit third party council that certifies veteran and disabled owned businesses as Diverse Suppliers. This certification can greatly increase access to a large number of corporations and governments in Canada who want to do business with Diverse Suppliers. Our experience with the Supplier Diversity world as business owners was very positive. Procurement managers and related professionals were engaged and interested in learning more about our company. That quickly turned into business opportunities – both as suppliers and as purchasers. We knew immediately that other business owners would benefit as well. Since the start, we received amazing support, advice and guidance from other certifying councils in many jurisdictions. 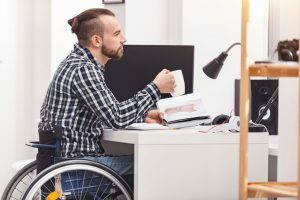 With ongoing mentoring from the City of Toronto, Toronto Dominion and the Royal Bank of Canada we are well positioned as we work together to ensure larger representation for Veteran and disable owned businesses in Canada. It is our sincere hope that you engage with the IWSCC and it provides and enables positive outcomes for your business. The IWSCC was created as a resource devoted to representing you and other engaged disabled and Veteran-owned businesses. Together, we will create new opportunities, reduce barriers and make the path easier for those coming after us. With your help, we can make this organization an influential force to bring about positive change in the Canadian market and beyond. Create opportunities; in business and in person. Information and awareness are important to the lowering of barriers for Veteran-owned and disabled-owned businesses. We help achieve this through news and events that not only inform, but educate as well. Please check back regularly for updates, or sign up below for automatic email notifications.